A stunning modern 18kt yellow gold bracelet, featuring 10 claw-set modified square cut medium intense yellow citrines, est. 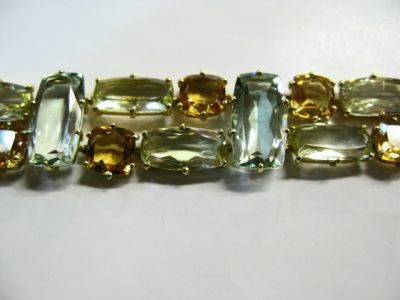 20.35ct; 10 claw-set modified step cut light intense yellowish-green prasiolites, est. 37.98ct and 6 claw-set modified step cut bluish-green prasiolites, est. 48.62ct. 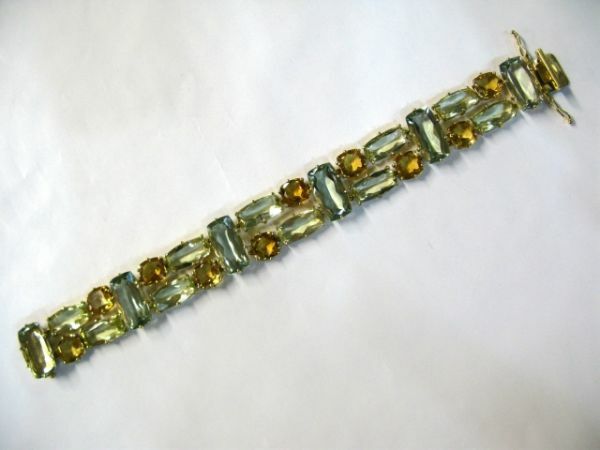 There are 2 hour-glass safety catches, one on each side of the clasp and the bracelet is approx. 7.5 inches (19.05cm) long.